Bridge tubes are employed to minimize iR drop and prevent a reference electrode’s fill solution from interfering with the chemistry being studied in an electrochemical cell. Certain electrochemical systems require this accessory and Princeton Applied Research has a variety of bridge tube designs. The complete list of bridge tube offerings is listed below. Standard 14/20 Taper Joint on top and Standard 28/15 Ball Joint. 72 mm to the top edge of the ball joint. 70.5 mm from the bottom of the ball joint to the tip. Tip incorporates a 4 mm Porous Glass frit. 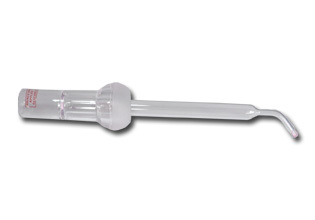 This item is similar to G0095 below, except the lower portion of the tube is shorter in the RDE0026. Provides isolation of K0077 Ag/AgCl(model with RDE0020 tube), or G0093 reference electrodes from test solution to prevent contamination of test solution by the reference electrodes's filling solution. Its Porous Glass frit makes it ideal for situations where leakage of the filling solution into the test solution must be kept at a minimum, with minimal electrical resistance. The K0065 is delivered complete and ready to use. Five replacement Porous Frits and five lengths of Teflon heat shrink tubing are also supplied. Standard 14/20 Taper Joint on top and 14/20 Taper Joint on outer sleeve. 78 mm from top of tube to bottom of outer taper joint. 78 mm from bottom of outer taper joint to end of tip. Bottom portion of Bridge Tube is ~ 4 mm OD flexible Teflon Tubing. Used with K0047 Corrosion Cell Kit. Standard 14/20 Taper Joint on top and Standard 28/15 Ball Joint. 72 mm to the top edge of the ball joint. 96.5 mm from the bottom of the ball joint to the tip. Tip incorporates a 4 mm Porous Glass frit. A reference bridge tube for use with the Model 303A. Allows a K0077 SCE or G0093 Hg/HgSO4 reference electrode to be substituted for the internal Ag/AgCl reference electrode. Recommended for analyses where trace Cl-or Ag+contamination could interfere.